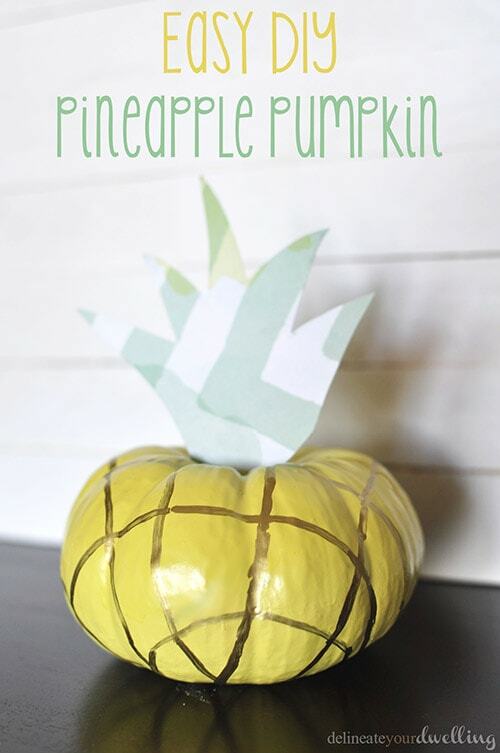 INSIDE : It is so much easier than you think to grow a pineapple plant! 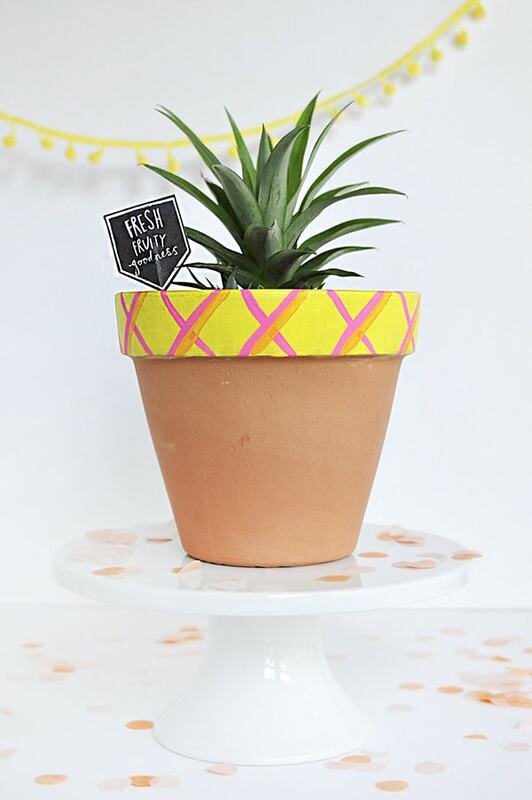 See my tips growing a pineapple from an existing fruit, as well as a fun craft tutorial for painting a DIY Pineapple Pot. 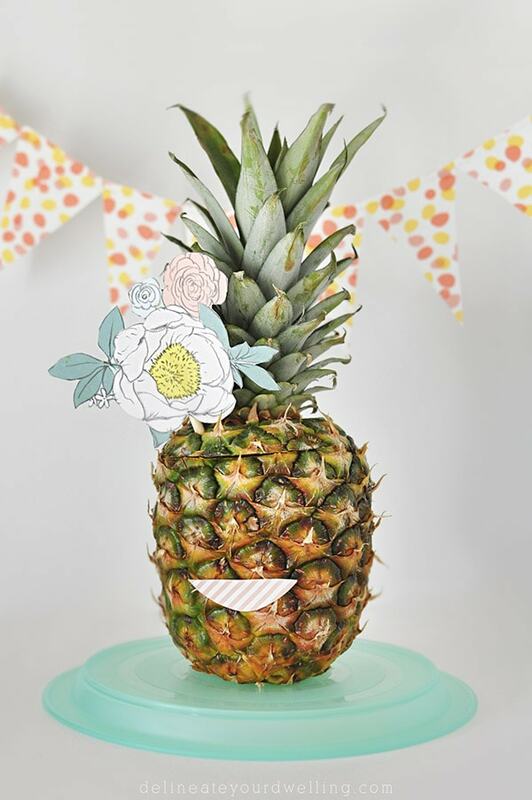 Today am sharing How to Grow a Pineapple (even if you accidentally decapitate your very very favorite plant ever – true story keep reading). 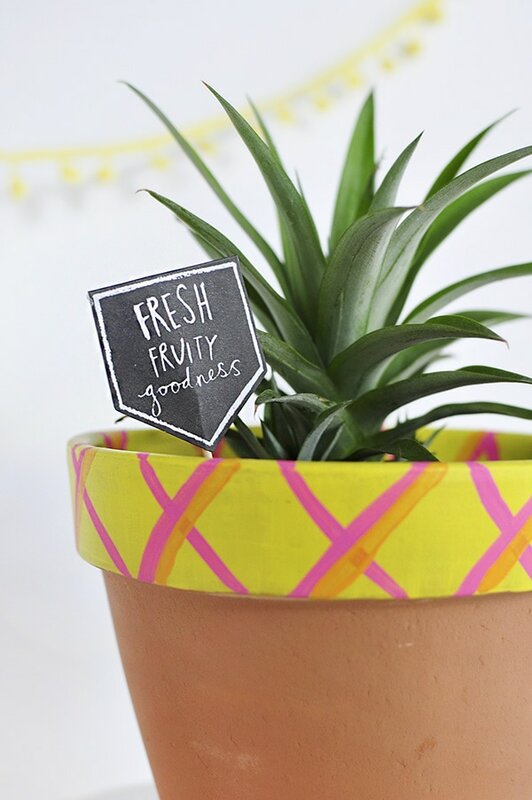 WHAT SUPPLIES DO YOU NEED TO GROW A PINEAPPLE? I went to Ikea early this summer and bought myself a pineapple plant. I loved that little guy and took such great care of him. Little by little he started to grow and then I repotted him. One morning, I was outside doing some yard work and walked by my little fruity plant. I noticed there was a spider making a web on the top of the leaves, so I took the trowel that was in my hand and casually brushed that little spider off. Well, tragedy hit and along with the spider being knocked off, my sweet little pineapple also tumbled to the ground. Do Pineapples Grow on Trees normally? 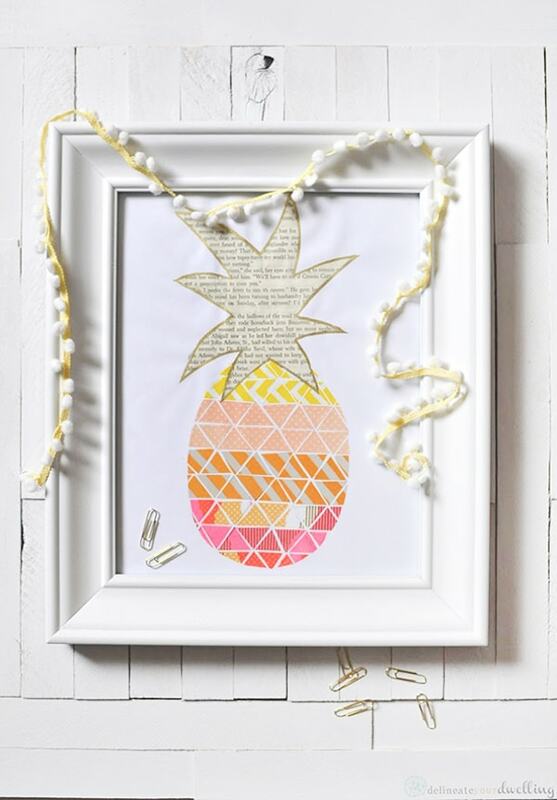 Surprisingly enough, pineapples do not grow on trees. I had thought they would be like a banana tree hanging down from tall branches. But, they grow from a big leafy plant in the ground, similar to what a yucca plant looks like. The plant consists of stocky leaves circled around a central stem. In a healthy plant, the tapered, swordlike leaves can grow up to about 5 feet long. 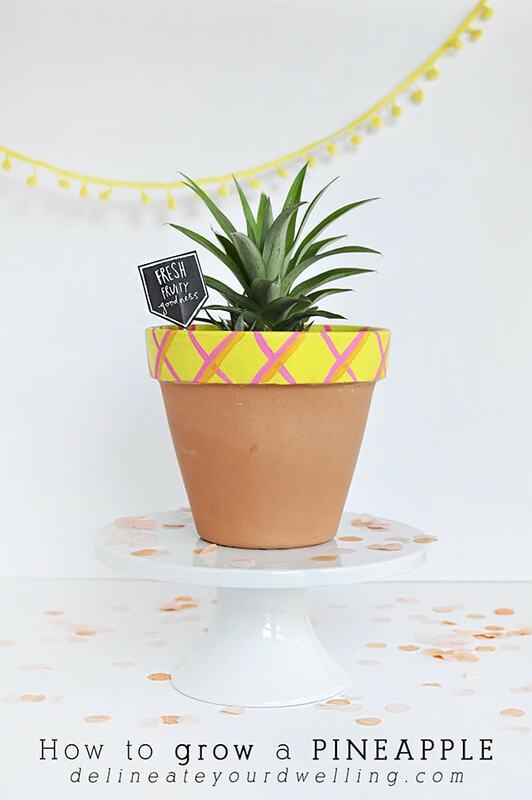 How do you grow a Pineapple Plant from a top? The first step requires gloves if you have a larger, more mature pineapple. Grab securely onto the base of the leaves and with your other hand, hold tight to the fruit. Give a few tight turns and the leaves should pull right out from the base. If this step doesn’t work for some reason, you can always simply cut the top off from your plant. I prefer twisting and getting a few of those baby roots with it if possible, though. Turn the leaves upside down and pull the bottom inch or so of leaves off from the base. You will be surprised, but about an inch or so up there are tiny little roots that have already started growing. Once you can see those little nubs of roots, you are at a stopping point for now. 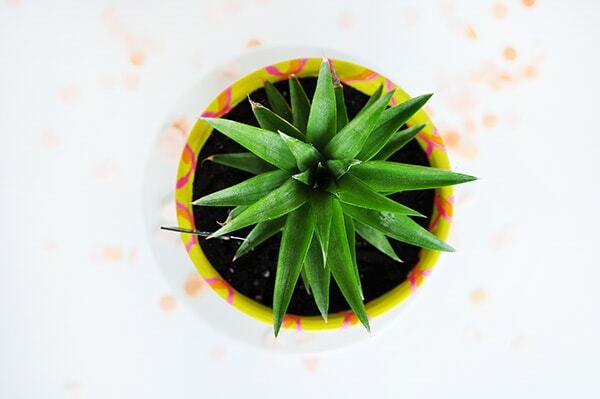 Find a sunny window sill and place your pineapple leaves in a glass of water to start growing those root systems out. Every few days I would empty my glass and get fresh water. It was amazing how quickly the roots grew. My roots were about 3″ long after a week or two. 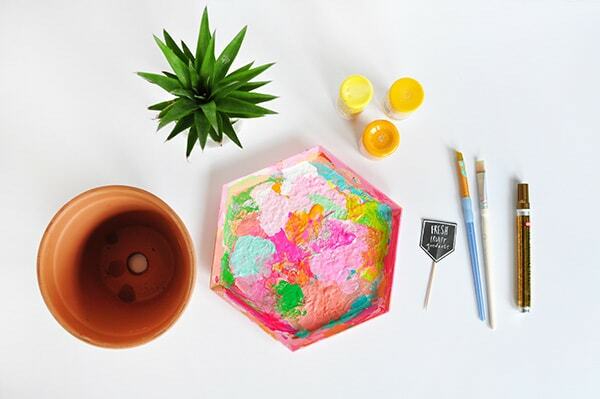 Once my plant was ready to be transferred from the water back into soil, I decided to paint myself a new terra cotta pot. 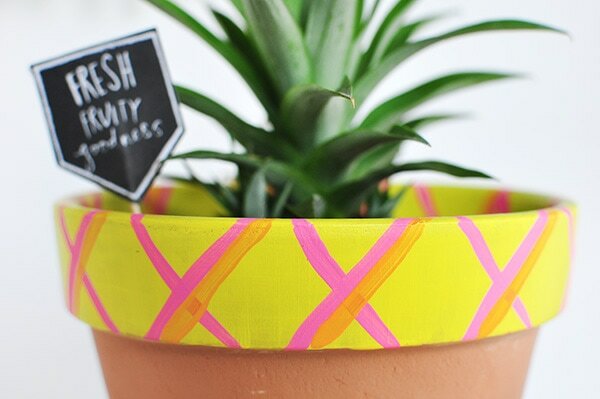 Using yellow acrylic paint, I painted the rim of the pot, inside and out. 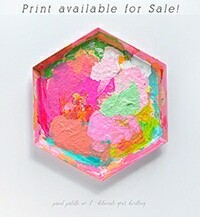 Then, I took a hot pink and a citrus orange and created a simple crosshatch pattern to represent pineapples. After my painted pot was dry, I added a handful of small rocks to the bottom of my pot to help with drainage. Then I filled the pot about 2/3 of the way full with potting mix. Next, I added the plant crown with it’s new baby roots into the pot and filled in the empty space with some additional potting soil. Lastly, I could not help adding a cute little sign. 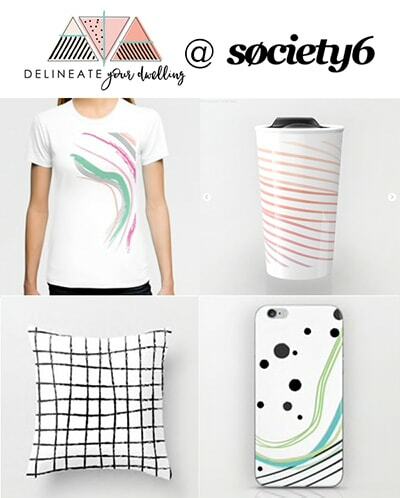 The cool thing about this is, you don’t have to start with an actual plant. 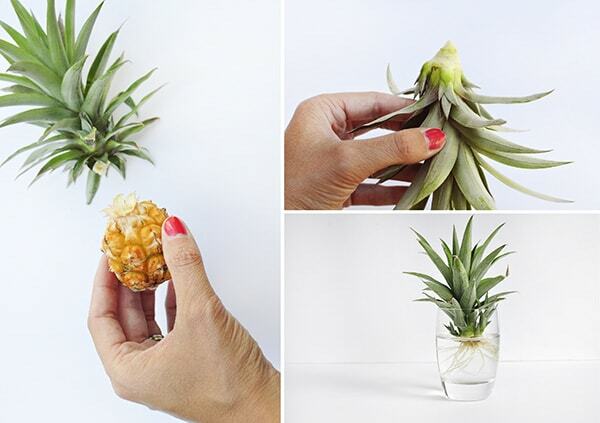 You can literally grow a plant from a pineapple purchased at the grocery store – how fun is that! What kind of sun requirements do Pineapple Plants need? I tried my plant in a few different lighting amounts : indoors with indirect light, outdoors with direct summer sun and then eventually outdoors in dappled shade. I noticed my pineapple seemed to do best indoors with plenty of sunshine and warmth and in moderate light/shade outside. I did bring my plant outdoors eventually because he did not like direct summer sun. When it got too much summer sun, he started to scorch and the fruit actually turned red in color. How long does it take a Pineapple plant to grow? I ended up keeping my plant outdoors but in light shade, light sun. These seemed to be the best light conditions for him. Pineapple plants are slow growers, so don’t expect to have pineapples the first year. What kind of care does a pineapple plant need? From my experience, the light amount was the biggest issue of concern for my plant. Once I found the ideal light conditions, my fruit plant was very happy. I watered my pineapple plant about once a week, each time putting my finger into the soil about 2″ deep to see if it was dried out enough. I never worried about fertilizing my plant. Guys, by this time next year I just might have a pineapple plantation going in my backyard!! Have you ever attempted to grow one?? Let me know in the comments below. Thank you for inspiring me to attempt to grow my own pineapples. I would love to send you some inspiring photos of growing pineapples. Thank you, Amy. Your baby pineapple looks ripe, and has a full top, so it likely would not have gotten any bigger. The first pineapple a plant produces is usually small. I’ve been growing pineapples here at my home in Florida, for quite a few years. I’m no expert, but I do love being able to grow them, and I’ve learned along the way. Also, be patient, they don’t produce every year. Great advice, Charlotte! Thank you for those tips. And I love that you’ve been growing pineapples at your home! 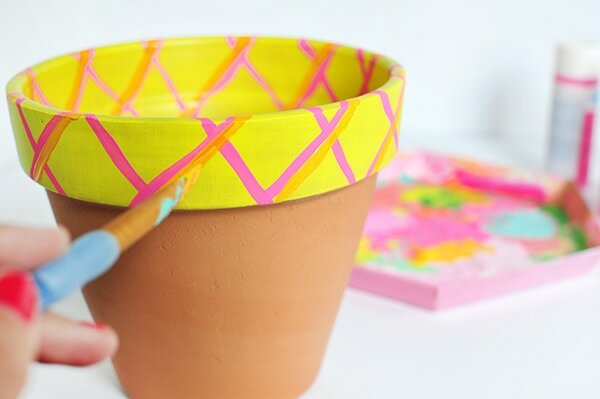 So cute, love your painted pot! We actually did grow a pineapple in our yard when we lived in Florida. If I’m remembering correctly, it took about a year to get fruit. Sadly, we left it on the plant too long and when we finally harvested it…it was mostly rotten…aargh!! Now that we’re in a warm climate again (south TX), i will try again. Good luck with yours! AH! That’s so amazing you had a real plant in your yard!! Well, after my little guy was chopped off, I cut him open and gave him a try. It actually tasted like a real pineapple, such fun! I am right now in my patio! The leaves are getting quite big since it came from a full-size pineapple from the grocery! Oh my goodness, how cool!!! I’m so excited to see mine growing again!